NORTH EASTON, Mass. – When the Oliver Ames girls’ soccer team traveled to Wrentham to take on King Philip for their second meeting of the season in mid-October, the Tigers scored early but had to rely on the heroics of goalie Regan Benton late to escape with two points. When the Tigers hosted the Warriors for their third meeting, this time in the D1 South Sectional Quarterfinals, Oliver Ames once again found the back of the net early on. But this time around, they made sure to add some insurance goals. With a 3-1 win over King Philip, #5 Oliver Ames advances to the D1 South Semifinals to take on top-seeded Natick on Friday afternoon. The Tigers seized the lead in the eighth minute, minutes after Benton made a key save on a corner kick to deny KP an early chance. After some miscommunication between a defender and the keeper, OA junior Abby Reardon snuck in, got a touch to get the ball behind and ran onto it to bury it to put the Tigers up 1-0. Reardon nearly grabbed a second a minute later in similar fashion but KP keeper Emma Durant was quick to react and smothered the chance. But four minutes later, Reardon was able to find the back of the net for the second time of the game. In the 13th minute, sophomore Zoe Chazan whipped a corner kick to the far post where junior Sofia Masciarelli nodded the ball back in front of the goal and Reardon headed it in from close range. King Philip gradually gained control of the game and enjoyed the majority of the possession for the final 20 minutes of the half. KP’s pressure paid off with a couple of chances. First Maddie Smith’s shot from distance was saved by Benton. In the 30th minute, Emma Corcoran dropped a free kick into the area that popped out to Abby Baker but her shot was just wide. Finally in the 33rd minute, the Warriors were able to break through. Corcoran delivered a perfectly weighted ball to the back post and Smith met it with her head and found the back of the net to cut the deficit in half shortly before the halftime break. While KP aimed to capitalized on its late first half momentum early in the second frame, Oliver Ames was able to steal it all back just three minutes in. A cross was bounced around in the area before coming loose. OA senior Lauren Wright pounced, ripping a shot to the far post leaving no chance for Durant to make it 3-1. From there, Oliver Ames controlled the play for the second half. The final 10 minutes saw a flurry of chances but neither side could find the back of the net. With just under 10 minutes to go, Rachel Hogan played Avery Snead along the line and her cross found Chloe Layne, but the shot from in close was blocked out for a corner. OA had a chance a minute later when Kiana Lozzi dropped a diagonal ball in for Wright, but Duggan was quick off her line to smother the chance. In the 74th minute, Jackie Mills tracked down a long ball and cut it back, laying it in the area for Tori Wyman but her bid rolled just wide of the post. It looked as though OA had a golden chance to seal the game in the 76th minute when Chazan looped a long ball for Wyman, who centered for an open Mills but Durant stood tall and blocked the open shot. “I thought Oliver Ames came out pretty fast and hard and it was unfortunate the first goal we gave up, it was a bouncer and should have been picked up,” KP head coach Gary Pichel said. “That set them up for another one and gave them the momentum. They’re an undefeated squad and this could be their year. We’re proud to be able to play with them and have the chance to get a shot at them. We improved so much over last year. We were 2-16 and now this year we finish 12-8-2, that’s a big change. Oliver Ames girls soccer will take on #1 Natick on Friday at 3:30 at Milford High School. King Philip finishes the 2016 campaign at 12-8-2 — but with plenty of optimism for the future. MANSFIELD, Mass. – It looked as though Sunday evening’s playoff game was over in the final seconds of regulation. With the clock stopped at 2:00 and everyone waiting for the official’s whistle, Emma Oldow got free on the right side and sent in a curling cross just past the dive of King Philip goalie Emma Durant and onto the foot of Amanda Mangano at the back post. Unfortunately for the Hornets, the sophomore forward had strayed just offsides and the celebrations of the home fans were cut short. Six minutes into the first overtime period and there was another celebration, this time from the traveling supporters behind the benches at Alumni Field. Emma Corcoran’s deep corner to the back post was met by freshman Avery Snead, who nodded it back across the net and inside the far corner for a ‘golden goal’. The Warriors had pulled the upset over their league rivals, avenged two losses in the regular season, and ended the Hornets unbeaten season in the first round of the tournament. “We practice all week on these corners and setting up the girls,” said KP coach Gary Pichel after his team’s 2-1 victory. “[Avery] came through with a huge one, just a huge one! It looked like it was going to go too deep and she was right where she needed to be. Mansfield coach Kevin Smith could only shake his head after the game. He had said before the game started that KP had improved over the course of the season and was a very dangerous opponent to have in the first round. He was proved right. The Warriors struck first in the 14th minute. Rachel Hogan got to a loose ball on the right corner of the penalty area and was brought down when she got a step on her defender. Corcoran stepped up and calmly dispatched the penalty into the top corner, leaving Mansfield goalie Emily Gaumond with no chance. After falling behind, Mansfield was spurred into the attack and had several chances for the equalizer before the break. Stephanie Kemp had the first good chance when she ran onto a ball behind the defense from Hannah Reiter but Durant was off her line quickly to smother. Oldow saw a shot sail just wide of the post and then Kemp again got in behind the defense but her effort missed the corner by inches. In the 53rd minute, the Hornets evened the score with a golazo from sophomore defender Emily Vigeant. After a foul 40 yards from goal, Vigeant put her laces into the free kick and hit a laser just under the crossbar and past a helpless Durant to make it 1-1. With the scores level, KP took a timeout to regroup and with the impetus on them to score again suddenly found their footing in the second half. Snead had the best chance after good footwork opened space for a shot that curled just wide. Maddie Smith created another chance with a steal in midfield and Chloe Layne’s one-touch pass freed Hogan but her shot was dragged wide. With six minutes left to play, Oldow sent in an angled cross that Durant stopped in the far corner but could not handle cleanly. The loose ball was prodded into the side netting by Allee Bezeau. Six minutes later, Mangano had her chance only to be denied by the whistle. In overtime, Snead rose highest. The freshman has been KP’s leading scorer this season and no goal has been bigger than the one she scored on Sunday. “I told them that we could be the team that beat them,” said Pichel. “I told them they’d have to play the game of their lives and they’d have to give 150 percent…and they did. I’m so proud of them. While the season has come to a close for the Hornets (14-1-4), Smith reflected on what has been by almost every measure the best fall in the 29-year history of the program. King Philip (12-7-2) will get the chance to avenge two more regular season losses on Wednesday afternoon with a trip to another league rival, Oliver Ames. MANSFIELD, Mass. – Coming into Tuesday night’s game with Kelley-Rex division rival King Philip, Mansfield could have been caught in the trap of looking past the Warriors. On Thursday, the Hornets will travel to Easton to face Oliver Ames in a game that could decide the league title and on Friday night they have the opportunity to play on the Gillette Stadium pitch against Canton. Mansfield’s seniors gathered the team together well before kick-off, even before head coach Kevin Smith had the chance to speak with his players, and re-focused their teammates. The pregame talk worked, as the Hornets dominated the opening half and scored a pair of goals. King Philip rallied in the second half, but the Hornets held on for a 2-0 victory that keeps them within one point of Oliver Ames heading into the final two games of the regular season. The Hornets were fired up to start the game on senior night and controlled the majority of the opening half. They controlled possession and pushed the Warriors back into the defensive third for much of the opening 40 minutes but the first shot on goal took nearly 20 minutes. When the shot finally came, it gave Mansfield the lead. A corner was played in from the near sideline and bounced around a few times in the six-yard-box before being tipped into the path of senior Hannah Reiter who prodded it home. Melissa Reef was given the assist out of the scramble. Six minutes later KP had a rare foray forward and Katherine Turner pushed into the attack from her left back position before sending in a perfect cross. Abby Baker had a chance at the far post but her shot sliced wide of the post. Emma Oldow picked off a poor clearance and set up a two-on-one with Stephanie Kemp, but Kemp’s shot from just inside the box was saved by KP keeper Emma Durant. The ensuing corner was cleared but the Hornets lofted the ball back into the box and the KP defense was caught trying the offside trap. Reiter, a Quinnipiac University-commit, was left all alone in the middle of the box. The senior turned and took a touch before firing a low shot that Durant parried at full stretch. Sophomore Cassidy McMahon was the first to react and she knocked in the loose ball to double the Hornets lead. KP fashioned a couple of chances in the closing minutes of the half. Freshman Avery Snead turned her marker and fired a shot from the edge of the box that seemed destined for the back of the net until Mansfield keeper Emily Gaumond managed to save at full stretch. The Warriors did turn the momentum after the break and turned the second half into an even contest. Maddie Smith had the first good chance of the half but her header on an Emma Corcoran corner flashed wide of the post. Mansfield almost put the game away seven minutes after the break when Emma Goulet sprung Oldow with a through ball behind the KP defense. Durant was out quickly to close down the angle and palmed aside Oldow’s shot to keep it 2-0. Bryn Anderson nearly set up Erin Daniel for the winner with another ball in behind the advancing KP defense, but Hanna Balunos> raced across to cover and knock the ball out for a corner with a last ditch tackle. Oldow would have another chance racing down the left channel but again Durant (seven saves) came up with the stop. The Warriors had one more chance to cut the lead in half with 13 minutes to play but Smith could not keep her header down when she rose highest in the box and it slipped just above the crossbar. Mansfield (14-0-2, 12-0-2) will now head into Thursday’s game with Oliver Ames knowing that a victory at Muscato Stadium will give the program its first ever league title. A draw against OA also keeps the title hopes alive as Mansfield has a league game in hand over the Tigers and would play Canton on Friday at Gillette knowing a result would clinch a title. King Philip (11-7-1, 10-5-0) has lost two in a row, against the top two teams in the division, and will try to bounce back against Franklin on Thursday. 1st Quarter: (A) Tyler McGovern 63 yard pass to Elvin Sam, Paul DeLuca XP good; (A) T. McGovern 36 yard pass to E. Sam, P. DeLuca XP good; (A) T. McGovern 1 yard rush, P. DeLuca XP good. 2nd Quarter: (A) Cam Furtado 8 yard rush, P. DeLuca XP good. 4th Quarter: (A) C. Furtado 3 yard rush, P. DeLuca XP good; (OA) Liston Funai 5 yard rush, Travis Campbell pass to Michael Mulrean 2pt conversion. 1st Quarter: (S) Justin Ly 87-yard TD, Josh Cocchi XP good; (C) Tony Harris 65-yard TD, Thomas Monagle XP good; (S) Ryan Sullivan 86-yard punt return, J. Cocchi XP good. 2nd Quarter: (S) Evan Gibb 60-yard pass to Izon Swain-Price, J. Cocchi XP good; R. Sullivan 3-yard rush, J. Cocchi XP good. 3rd Quarter: (S) E. Gibb 19-yard pass to Jack Connelly, David Cellucci 2-point rush; (S) I. Swain-Price 94-yard rush, XP no good. 4th Quarter: (C) Joe Mulkay 8-yard rush, Dan Alice 2-point rush; (C) Dan Dillon 1-yard rush, T. Monagle XP good. 1st Quarter: (F) Mark Clagg 24 yard pass to Jamaine Few, John Cronin XP good; (M) Blake Hill 58 yard rush, Sean Lehane XP good; (F) Phil Dure 5 yard rush, J. Cronin XP good. 2nd Quarter: (M) B. Hill 5 yard rush, S. Lehane XP good. 3rd Quarter: (M) B. Hill 2 yard rush, S. Lehane XP good; (M) B. Hill 56 yard rush, XP blocked. 4th Quarter: (M) Ryan O’Toole 56 yard rush, S. Lehane XP good; (M) Matt Curran 22 yard pass to Chris Rivera, S. Lehane XP good. 1st Quarter: (KP) Shane Frommer 62 yard punt return, XP good. 2nd Quarter: (KP) S. Frommer 15 yard rush, XP good. 3rd Quarter: (KP) S. Frommer 11 yard rush, XP good; (KP) Brendan Lydon 1 yard rush, XP good; (F) Jacob Wolowacki 1 yard rush, XP good. 4th Quarter: (KP) B. Lydon 5 yard pass to Brett Mazur, XP good; (F) J. Wolowacki 3 yard rush, XP no good. 1st Quarter: (M) Anthony DeGirolamo 1 yard rush, Diogo DeSousa XP good. 2nd Quarter: (M) Nick Graham 44 yard rush, N. Graham 2pt rush; (T) Noah Leonard 15 yard pass to Adam McLaughlin, 2pt failed; (T) Brevan Walker 5 yard rush, N. Leonard 2pt pass to Mike Fernandez. 3rd Quarter: (M) Travis Sjoberg 55 yard interception return, D. DeSousa XP good; (T) B. Walker 10 yard rush, 2pt failed. 4th Quarter: (M) Joe Cox 5 yard rush, D. DeSousa XP good; (T) B. Walker 3 yard rush, XP good. Milford, 0 @ Attleboro, 0 – Final – Milford head coach Brian Edwards said Danny Mendoza played “exceptional defense” for the Scarlet Hawks and added Joey Madden did a great job up front. Foxboro, 1 @ Oliver Ames, 2 – Final – James Gillespie scored twice, once in each half, as Oliver Ames rallied from an early deficit. Matt Campbell and Thomas McCormick notched assists for Oliver Ames in the win. North Attleboro, 0 @ Mansfield, 1 – Final – James Chotkowski netted the game winning goal with just five minutes to play to lift the Hornets. Max Gurnon’s throw in was headed on by Kevin Bouck to Chotkowski, who finished for the lone tally of the game. Sharon, 0 @ King Philip, 5 – Final – Cam Mullins scored a brace, both off corners, and Connor Mullins recorded three assists for the Warriors. Colby Koch, Tyler Mann (from Larsen Keys) and Cam McGovern also scored for KP. Stoughton, 3 @ Franklin, 2 – Final – Franklin built a two goal lead in the first half but the Black Knights stormed back with three unanswered goals to grab the win. Farley Asmath and Nitin Chaudury netted goals off assists from Liam Kapples to put the hosts up 2-0. Stoughton answered as Noah Schulze scored on a free kick from 30 yards out and then tied the game before the break on Tyler Melo’s strike from outside the area. The Black Knights netted the game-winner with Melo finishing off a cross from Jordan Asnes. Stoughton head coach Aaron Salter said, “It was an excellent team performance today from every player.” Salter had specific praise for his back line as well as Melo and junior Brian Peoples. Attleboro, 0 @ Milford, 1 – Final – Milford senior Sydney Morrison netted the lone goal of the game off an assist from Kristen Franzini to help the Scarlet Hawks edge Attleboro. Milford head coach Jay Mastaj said Maggie Boyle and Ashleigh Starks both played well for the Scarlet Hawks. Mansfield, 2 @ North Attleboro, 1 – Final – Hannah Reiter scored both goals for the Hornets, including the winner on a header off an Emily Vigeant corner with eight minutes remaining. Stephanie Kemp assisted the first Mansfield goal. Emily Schromm scored North Attleboro’s goal to tie the game at 1-1 in the second half off an assist from Haley Guertin. North interim head coach Bill Wallace said Aine Mendonca played well for the Rocketeers. 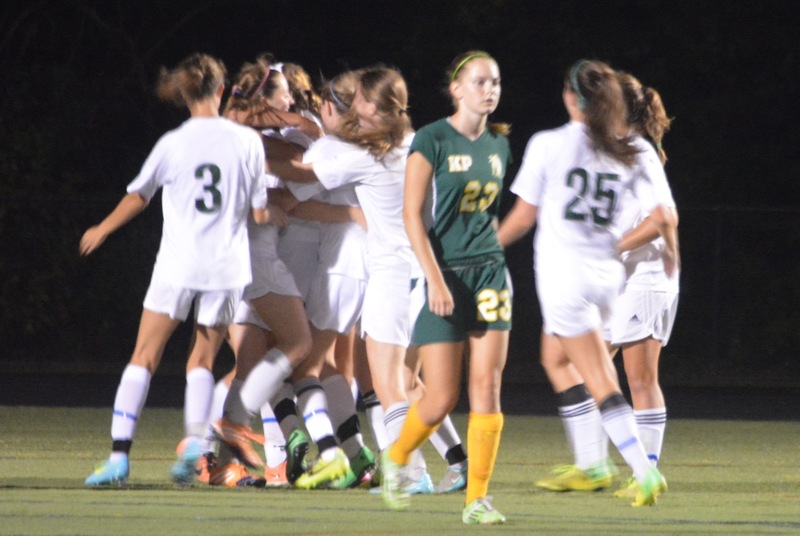 King Philip, 2 @ Sharon, 1 – Final – Avery Snead (from Maddie Smith) and Abby Baker scored the goals for the Warriors. Ally Filipkowski scored the goal for the Eagles off an assist by Alex Rabb. Franklin, 4 @ Stoughton, 0 – Final – Meghan Doherty, Miranda Smith, Sara Yelle and Molly Duncan scored the goals for the Panthers, while Calen Frongillo has a pair of assists and Emily Mastaj and Nadia Havens each had one. Canton, 3 @ Taunton, 0 – Final – Canton picked up the win 25-13, 25-9, 25-15 in what head coach Pat Cawley called a “great team effort.” Nicole Poole controlled the offense skillfully, dishing out 27 assists and adding two kills and two aces. Hannah Jerrier had a 10 kills with no errors, hitting an impressive .435. Casey Shea added seven kills with just one error, hitting .545. Julia Panico was “outstanding” in the back row according to Cawley, finishing with 20 digs. Erika Lum, Maria Mackie and Emily Lynch combined for 33 digs for the Bulldogs. North Attleboro, 1 @ Mansfield, 3 – Final – Mansfield notched a 25-13, 25-17, 19-25, 25-21 win at home over the Rocketeers. Meg Hill led the Hornets with 10 kills and six blocks, Olivia Broyles had eight blocks and played strong defense. Julia Harrison had seven kills, Jess Haradon added 23 digs and Chloe Peters had 33 assists and 14 service points. Sharon, 0 @ King Philip, 3 – Final – King Philip earned the sweep on the road with a 26-24, 25-18, 25-19. Sydney Phillips led KP with 16 kills and 14 service points, Carly Adams added 18 service points and 22 assists, Amanda Loewen chipped in with eight digs, Liv Balduf had four kills and nine service points and Angela Vellante added 15 service points and three digs. Stoughton, 1 @ Franklin, 3 – Final – Lauren McGrath helped set Franklin up for victory, notching 33 assists along with seven digs and three aces to lead the Panthers. Erin Skidmore had 15 kills and 11 digs, Maddie Kuzio had 21 digs and three aces, Lindsay McGowan contributed with seven kills, four digs, three aces and Meaghan Maguire finished with eight blocks and five kills for Franklin. For Stoughton, Riley Bagley had 43 digs while Val Whalen added 17 kills and sophomore Molly Turner had 20 assists. 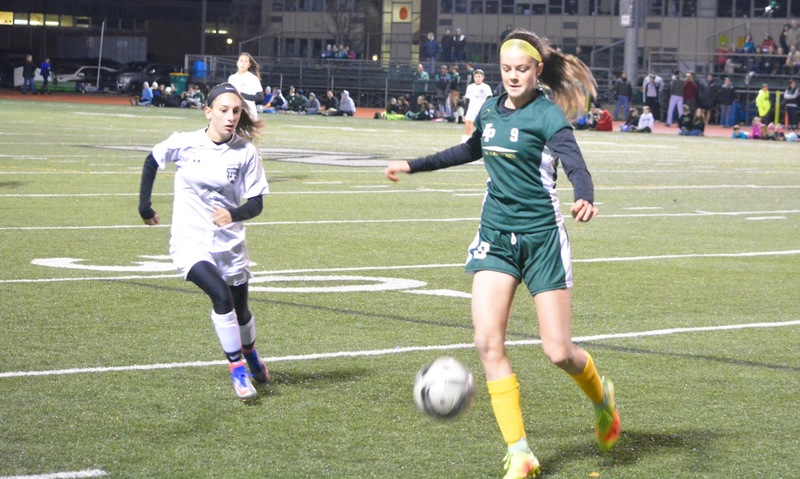 King Philip, 0 @ Stoughton, 1 – Final – Gianna Barbosa stopped 10 shots, earning the shutout as the Black Knights handed King Philip its first loss of the season. Kelli Joyce scored the game winner for Stoughton early in the second half off an assist by Julia Russell. Mansfield, 173 @ King Philip, 155 – Final – King Philip’s Danny McLaughlin earned match medalist honors, shooting a low round of 37 to lead the Warriors. Senior Jack Citarell finished with a 40 for the Warriors but picked up birdies on both the fifth and sixth hole to help KP. Sebastian Ladoulis and Matt Stanton both shot 39 for KP. Jason Hindman led Mansfield with a 39. King Philip, 2 vs. Walpole, 1 – Final – Maddie Smith opened the scoring for KP off a Rachel Hogan assist 13 minutes into the game. Walpole tied it before halftime, but the Warriors found a winner with less than three minutes remaining. Julia Massarone scored the game-winner from an Emma Corcoran assist. Taunton @ New Bedford – Postponed to TBD. Taunton, 191 @ King Philip, 169 – Final – Danny McLoughlin shot a team-low round of 39 to lead King Philip. King Philip, 1 @ Attleboro, 1 – Final – Tyler Mann gave the Warriors a lead in the second half but Ahijah Joseph equalized in the final ten minutes as KP and Attleboro finished level. North Attleboro, 0 @ Canton, 2 – Final – Click here for a full recap. Sharon, 1 @ Foxboro, 0 – Final – Ben Stromm headed home a corner with four minutes remaining in the game for the Eagles. Mansfield, 3 @ Taunton, 0 – Final – Mansfield senior Max Gurnon opened the scoring with a heads up free kick, catching Taunton off guard with a free kick from midfield to put the visitors up 1-0 just seven minutes into the game. Just before the half hour mark, James Chotkowski headed in a throw in from Gurnon to give Mansfield a 2-0 lead at half. Jackson Murphy capped the scoring for Mansfield in the 65th minute, finishing off a free kick from Sam Hyland. Jed Tolbert made six saves in recording his second straight shutout for Mansfield. Oliver Ames, 1 @ Franklin, 0 – Final – Click here for a full recap. Milford, 2 @ Stoughton, 6 – Final – Click here for a full recap. Attleboro, 0 @ King Philip, 5 – Final – Chloe Layne scored a pair of goals for the Warriors and Emma Corcoran had a goal and an assist. Avery Snead and Logan Greenberg also had goals for KP and Maddie Smith added an assist. Madison Brown made 12 saves for the Bombardiers. Canton, 0 @ North Attleboro, 4 – Final – Ashlyn Gaulin and Haley Ferrin both scored a brace for the Rocketeers. Haley Guertin recorded a pair of assists and Rachel Labonte had an assist for North. Foxboro, 4 @ Sharon, 1 – Final – Hailey Mailing scored a hat trick for the Warriors, lifting Foxboro to its first win of the season. Alex Rabb scored from the penalty spot for Sharon. Taunton, 0 @ Mansfield, 4 – Final – Hannah Reiter scored a goal and recorded an assist for the Hornets. Emma Oldow, Emma Goulet and Bryn Anderson each scored a goal for Mansfield. 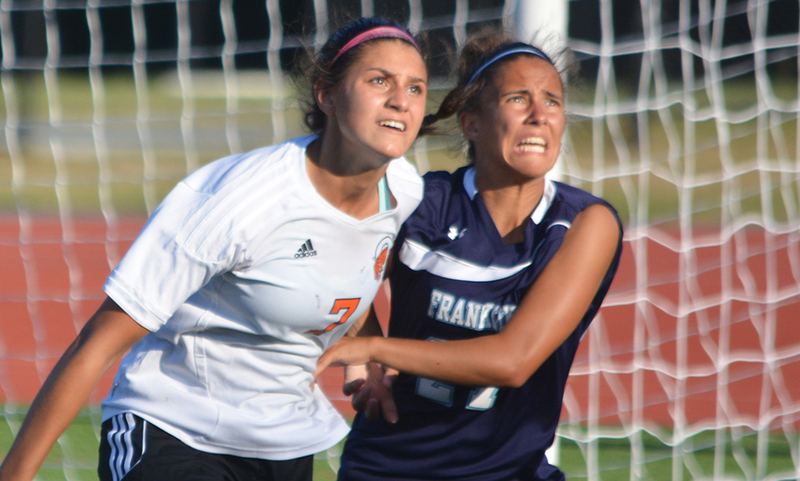 Franklin, 1 @ Oliver Ames, 1 – Final – Miranda Smith scored the opener for the Panthers and Lauren Wright tied it off a cross from Julia Roy for OA in the second half. Stoughton, 0 @ Milford, 2 – Final – Kristen Franzini and Juliana France scored the goals for Milford and Hawks coach Jay Mastaj credited Nicole Dahlgren with a solid game on defense to keep a clean sheet. Foxboro, 3 @ Stoughton, 0 – Final – Kelly Fisher, Meredith Cronin, and Catherine Luciano scored the goals for the Warriors. Oliver Ames, 0 @ King Philip, 0 – Final – King Philip peppered Oliver Ames but was unable to breakthrough as KP goalie Katie Vamosi stood tall. Vamosi came away with 14 saves on the day as she stifled KP’s attack (15 corners). 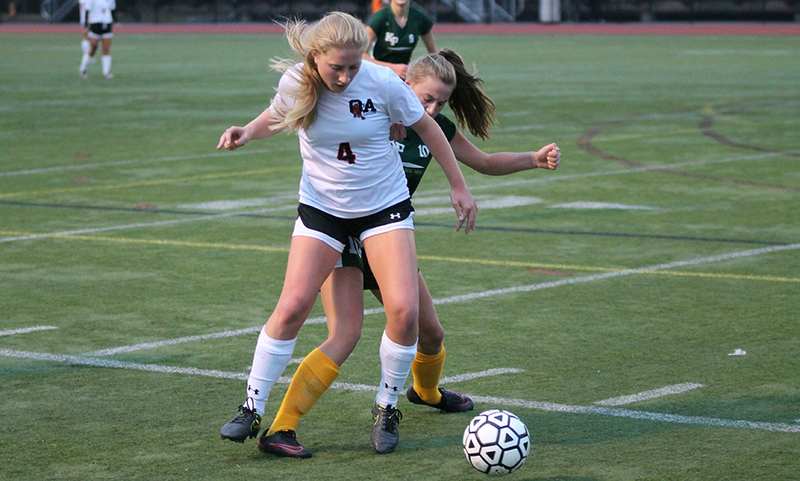 OA head coach Abby Tepper also lauded the play of Dimitra Efremidis in the midfield. Oliver Ames, 149 @ Mansfield, 172 – Final – Brady Allbritton shot a 34 at Norton Country Club to earn match medalist honors, leading OA to another win. Ryan McGarry added a 37 and Matt Kelley finished with a round of 38 for the Tigers. Brendan Loomer shot a team-low 41 for the Hornets. Sharon, 176 @ Franklin, 156 – Final – Bryan Woelfel led the way for the Panthers, earning match medalist honors with a round of 38. Tyler Langevin and Matt Dao each finished with a round of 39. Corey Carter led Sharon with a round of 42. Attleboro, 185 @ Taunton, 178 – Final – Mike Volkmann was the match medalist, carding a round of 37 to lead the Tigers; Justin Proto finished with a 38. Kyle DelSignore was Attleboro’s top finisher, carding a round of 44. North Attleboro, 195 @ Canton, 194 – Final – In a battle of the top two Davenport teams, the match was forced to a fifth card and Canton emerged with a one stroke victory. Tommy Dimock led the way for the Bulldogs with a round of 37, Matt Minichiello and Danny Powers both shot 38 and Jackson Maffeo carded a round of 40. North Attleboro’s Dylan Kane was the match medalist, finishing with a round of 36 while Robbie Congdon shot a 37 and Tyler Sincola shot a 39. Attleboro, 35 @ Mansfield, 24 – Final – Attleboro’s David Seybert won the race in 17:04 but Mansfield used its depth to get the team win. Kalin Petrov finished first for Mansfield – second overall – in 17:21 while Patrick Heavey finished third in 17:41. Collin Rice (18:06) and Kevin Crawford (18:09) finished fifth and sixth and Nick Rispoli was eighth overall in 18:19. Attleboro’s Alex Boedecker (17:43) was fourth and Garrett Gillard (18:12) finished seventh overall. Oliver Ames, 21 @ King Philip, 37 – Final – Brent Schwartz won his second consecutive race to lead Oliver Ames past King Philip. King Philip’s Jack Angelo finished third and Mike Griffin was fourth. Franklin, 20 @ Taunton, 39 – Final – Franklin placed a trio of juniors in the top four places, including the top two finishers, to beat Taunton. Nicole Clermont placed first in a time of 21:05 while Kate Hartnett was second in 21:13. Ella Gutkowski finished in fourth overall, clocking in at 22:08. Oliver Ames, 31 @ King Philip, 26 – Final – King Philip grabbed the top two finishers and had four of the top six finishes to edge Oliver Ames. Erin Quinn won the race for KP while Lucy Hamilton finished second. Nina Sitarski and Leia Quinn clocked in at fifth and sixth overall. Liz Peckham and Caroline McCarthy led Oliver Ames with third and fourth finishes respectively. Attleboro, 2 @ Stoughton, 1 – Final – Nick Lawrence scored a pair of goals for the Bombardiers, with assists coming from Will Halben and Harry Lancaster. Stoughton’s Noah Schulze scored the lone goal for the Black Knights. King Philip, 1 @ Foxboro, 0 – Final – KP junior Connor Mullins won possession at midfield, got forward and played a through ball, setting up Tyler Mann for the lone goal of the game in the 67th minute to lift the Warriors to the win. Taunton, 1 @ North Attleboro, 3 – Final – Click here for a full recap of the game. Stoughton, 0 @ Attleboro, 2 – Final – Rebekah Entwistle and Hannah Meier scored the goals for the Bombardiers. Stoughton head coach Tara Daniels said Emma Harrington played outstanding in net for the Black Knights. Foxboro, 3 @ King Philip, 5 – Final – Freshman Avery Snead scored two goals for KP. Senior Rachel Hogan and freshman Chloe Layne each had a goal and two assists and senior Maddie Smith added a goal and an assist for the Warriors. North Attleboro, 6 @ Taunton, 1 – Final – Haley Guertin scored two goals and had two assists to lead the Rocketeers. Sophomore Ashlyn Gaulin chipped in with a pair of goals and Felicity Monfils and Leah Jette each scored one. Kayla Pasquel and Rachel Labonte had assists for North. Milford, 0 @ Franklin, 4 – Final – Miranda Smith scored a pair of goals for the Panthers and Nadia Havens recorded a goal and an assist. 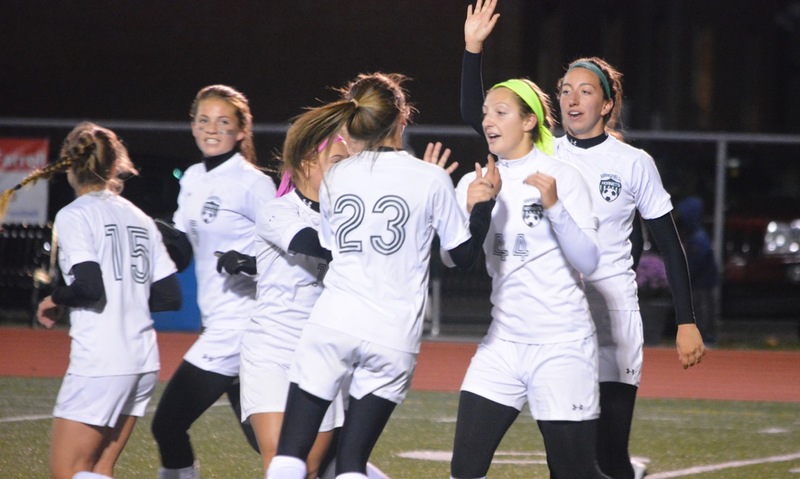 Halle Atkinson also had a goal for Franklin, while Ellie Teixeira, Abigail Gipson, and Emily Mastaj had assists. Ashleigh Starks played well in midfield for the Hawks, according to head coach Jay Mastaj. King Philip, 174 @ Mansfield, 169 – Final – Jason Hindman shot a one under par 35 at Norton Country Club to lead the Hornets. Junior Brendan Loomer shot a 44 while David Norris and Madison Haughey each shot 45. Sebastian Ladoulis led King Philip with a 41. Oliver Ames, 156 @ Taunton, 194 – Final – The Tigers of Oliver Ames had a consistent day at Segregansett Country Club. Ryan McGarry, Mark Bissonette, Nick Lombardi and Thomas Walsh all tied for the match medalist, with each shooting 39 on the day. Justin Proto led Taunton with a 43. Milford, 167 @ Sharon, 173 – Final – Ryan Tomaso was the match medalist, shooting 39 at Spring Valley. Anthony Arcudi added a 42 for the Scarlet Hawks. Andrew Glaser led the way for Sharon, carding a 40. Sharon, 15 @ Foxboro, 50 – Final – Foxboro was led by by Brendan Foley (20:37), followed by Matt Kelly (20:40), Mike Lite (21:01), Tyler Donovan (21:13), Jacob Sylvestre (21:14) and Paxton Downs (21:39). Mansfield, 19 @ Taunton, 44 – Final – Mansfield had seven of the top eight finishes and eight of the top 10 in the win over Taunton. Kalin Petrov won the race in a time of 17:07 while Taunton’s Dylan Lynch was second at 17:17. Mansfield’s Collin Rice (17:56), Patrick Heavey (17:56), Nick Rispoli (18:11), Arjun Sonti (18:12), Paxton Howard (18:17) and Cullen Lancaster (18″49) finished third through eighth respectively. Oliver Ames, 25 @ Franklin, 30 – Final – Oliver Ames secured three of the top five spots to edge out the Panthers. OA’s Brent Schwartz won in 17:31 while Zane Reservitz finished fourth in 18:03 and Colin Herschlag was fifth at 18:05. Franklin’s Everett Henderson finished in second at 17:44 and Mike Hagen was third at 17:49. King Philip, 15 @ Attleboro, 46 – Final – King Philip had the top five finishes in the race, cruising to a win on the road. Nina Sitarski won the race with Erin Quinn, Lucy Hamilton, Leia Quinn and Erica Layna rounding out the top five for the Warriors. Ellen Marshall finished six and Victoria Pike was seventh to lead Attleboro. Sharon, 23 @ Foxboro, 38 – Final – Foxboro sophomore Lindsey Nelson led the way for Foxboro, finishing second in 21:36 while freshman Abby Hassman finished third overall in 21:47. Oliver Ames, 32 @ Franklin, 23 – Final – Franklin grabbed the top three finishes in the meet, securing the win over Oliver Ames. Nicole Clermont won the race in 19:58 with Kate Hartnett finishing second in 21:22 and Ella Gutkowski rounding out the top three in 21:51. Liz Peckham, Anna Loewald, Caroline McCarthy, and Jordan Rainville finished in the fourth through seventh places for OA. Click HERE for a photo gallery from the game. CANTON, Mass. – The ball seemed stuck in the King Philip defensive third. Canton was creating chance after chance but somehow between the post and Warriors keeper Maggie Hall (13 saves) the Bulldogs could not find the breakthrough. Out of nowhere KP strung together a counter attack that had the potential to turn the game on its head. With just 15 minutes left, the ball found its way to senior Kate Sexton on the left side and she beat her defender before sending in a low cross that picked out Maddie Smith in the box, but her first-time, point-blank shot was saved by Canton goalie Kathryn Doody, who had been little more than a spectator for most of the game. It was a wake-up call for the Bulldogs that for all their possession the game was not yet won. Three minutes after the scare, Canton finally found the back of the net. Tessa Cudmore snuck a pass behind the right back to Sarah Collins whose shot was tipped onto the bar by Hall into the path of senior Meaghan Hunter for what turned out to be the game-winner. Hannah Link added a second with just eight minutes left and Canton walked away with a 2-0 victory over KP on Wednesday night at World War II Veterans Memorial Field. Cudmore nearly put the Bulldogs ahead in the third minute only to be robbed by a sliding Hall at the edge of the box. Two minutes later Rachel Hogan created a rare chance for the Warriors when her cutback found Victoria Ely but the freshman’s shot was stopped by Doody at full stretch. Link had a chance in the 14th minute when she rolled her defender and had a breakaway but again Hall came to the Warriors’ rescue. In the 33rd minute, Hall was tested by a strong shot from Sarah Connolly but she was able to tip it over the bar. There was a scramble on the corner, but KP managed to clear. The first half saw both teams pass the ball around in the midfield but after halftime it was almost entirely one-way traffic as the Bulldogs pressed KP back into its own third of the field. In the 50th minute, Hall had to be quick off her line to stop a Cudmore break and six minutes later Link beat Hall at her near post only to see the shot cannon off the post. “In the second half, when we won all the 50-50 balls…we were in our attacking third almost the entire time and it changed the game,” explained Howarth. It could have been a very different result when KP created its only chance. Doody managed to get her hands up, stay big, and block the shot from close range after great work down the left by Sexton. Howarth admitted that there was some frustration starting to set in for the Bulldogs after missing so many chances in the game. But, with 12 minutes left, Hunter found herself in the right place at the right time to tap in the goal that eased the tension. After waiting so long for the first goal, the second seemed to follow right away. Link was first to a rebound after Hall made another smart save low to her left. The junior forward followed up and essentially wrapped up the win for the Bulldogs. Canton (2-0) will put its perfect record on the line against Foxboro on Friday, while KP (1-2) will open the school’s new turf field against Mansfield.